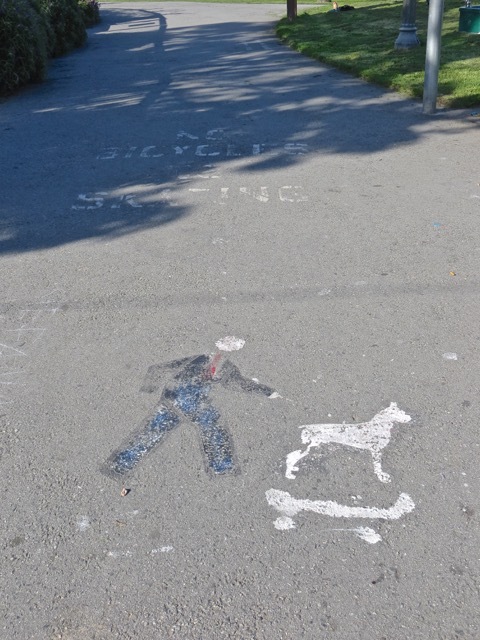 I described in SFM #126 a small park in San Francisco that has a dog run. 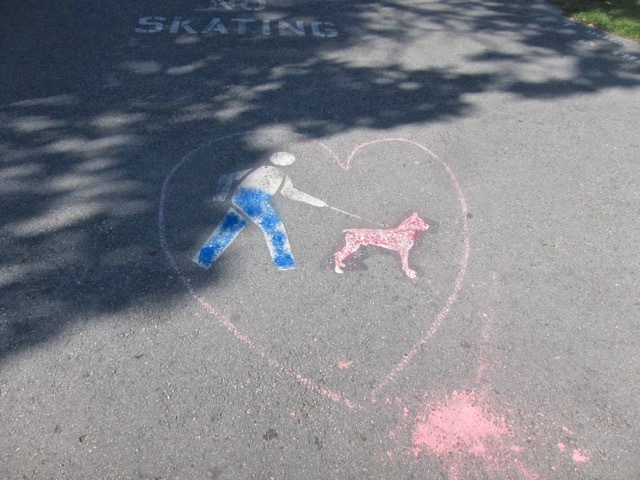 Dog owners bring their pets to this park to exercise and to socialize with other dogs. 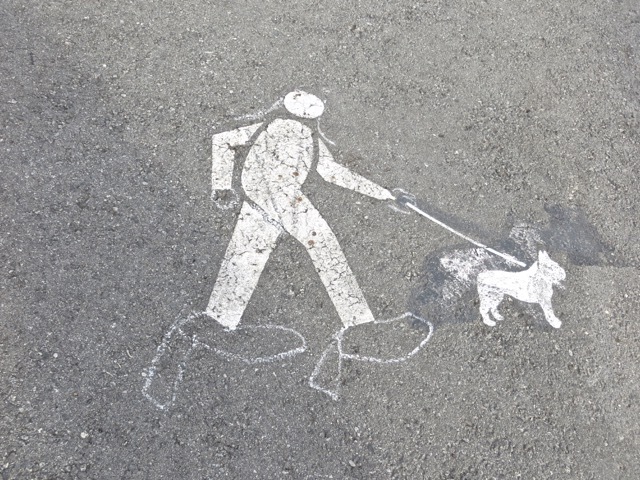 Pictures of dogs and owners had been painted on its paths to remind owners to leash their dogs while on the paths. Some people took liberty and expounded on the pictures. After exposure to the elements for years, some painted figures are getting smudged. Our creative neighbors went to work. A child probably added high heel shoes and two ponytails to this figure. Somebody loves this colorful boxer and its semi-colorful owner. The man in suit turns orange from long exposure to the sun and limelight. 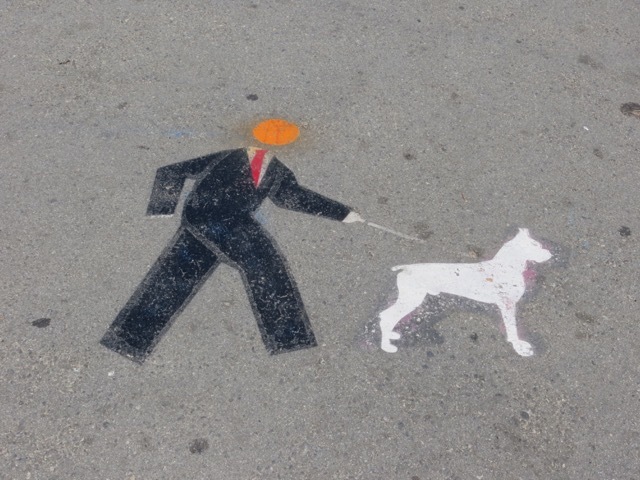 Can it be Donald Trump? 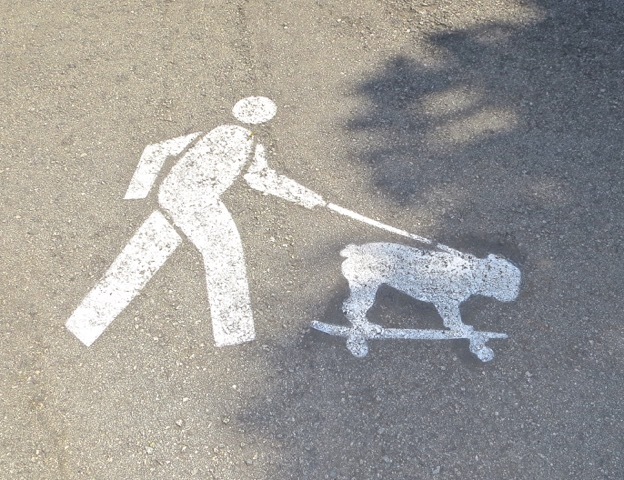 As skateboarding is not allowed on the path, a rebel puts the dog on a makeshift skateboard. The insurrection catches on. This bull dog is also skateboarding. 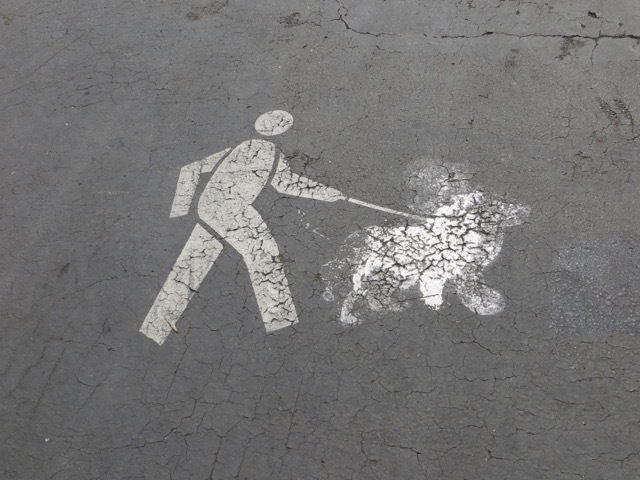 Cat owners are urged to keep their cats on leash as well. 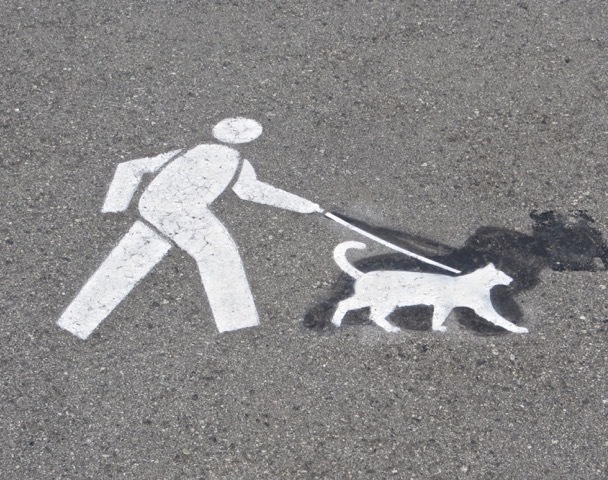 Walking a cat must be a delightful but frustrating endeavor. 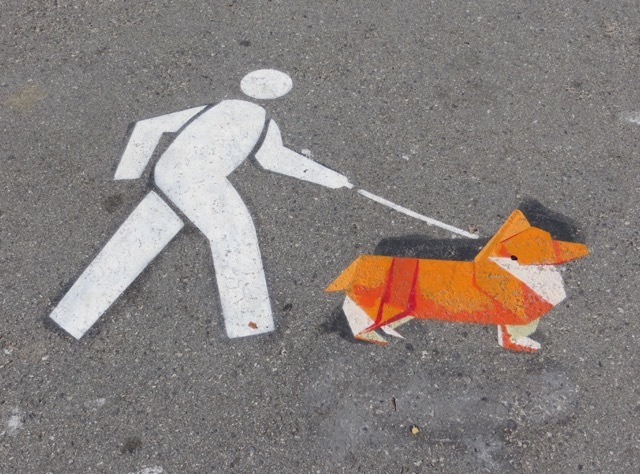 An origami corgi adds 3-D color to the white paintings. 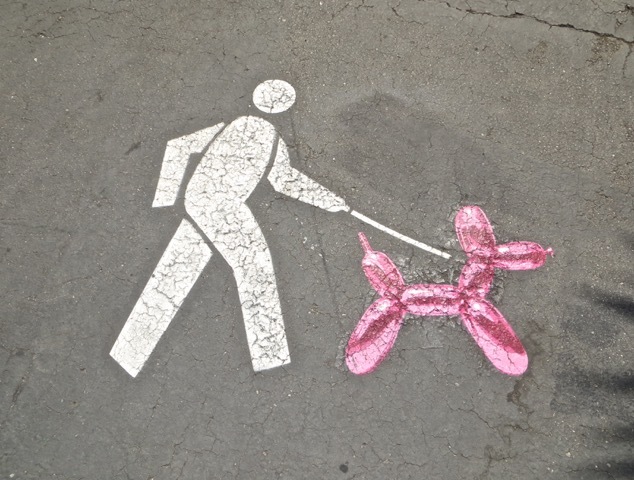 A balloon sculpture of a dog escapes from a child’s party. 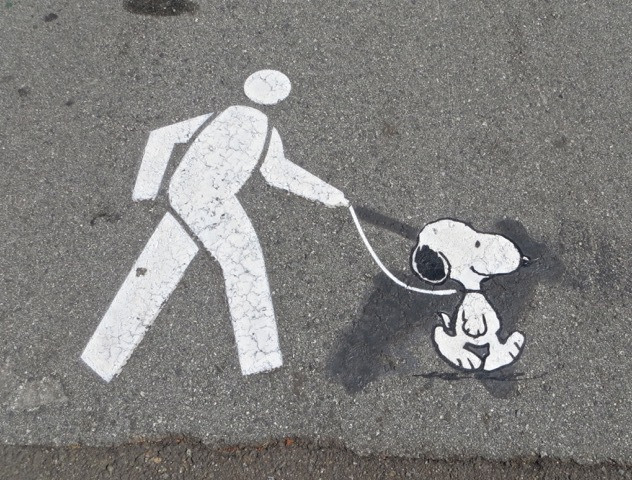 Charlie Brown gave Snoopy to a faceless stranger. Snoopy appears to be happy with his new hooman. Good grief! Posted by Robert Wu on Saturday, July 23, 2016, at 8:43 pm. Filed under Uncategorized. Follow any responses to this post with its comments RSS feed. You can post a comment or trackback from your blog.